BHUBANESWAR: The Department of Posts has begun to rapidly upscale its parcel operations to cash in on e-retail boom in the country. It is all set to expand the integrated parcel and booking hubs across major locations while establishing a mechanised nodal delivery system soon, Union Secretary Kavery Banerjee said here on Tuesday. Riding on the e-commerce growth, parcel and order delivery to customers through India Post has seen a major upswing in recent years. The parcel operations have, in fact, emerged the major revenue earner for the Department as traditional postal services have almost been pushed to oblivion on the onset of emails and mobile phones. Australia Post chief executive Ahmed Fahour has signalled the death of the letter, declaring its mail service will “never ever make money again”. And posties might have to feed pets, check meters and even check on the elderly to keep their jobs as mail continues to diminish as a business. The nation’s 207-year-old postal service saw its net profit dive 84 per cent to $16 million in the six months to December 31, after a record decline in the number of letters being sent. Parcels business performing well with domestic volume growth but market pressure from global competitors rising. Australia Post today reported a net profit before tax of $1.4 million for the six months ended 31 December 2015. The organisation signalled it expects to return to a full year profit in 2016 following a $222 million loss last year. The half year result was driven by the accelerated decline in letter volumes across the fixed-cost network. However it is expected changes to the letters service, implemented in January 2016, will reduce the growing losses in the mail business. Managing Director & Group CEO Ahmed Fahour said the half year result highlighted why reform to the letters service was absolutely necessary to ensure future sustainability of the business. “We have made a number of difficult decisions recently to help put Australia Post on the right path to take advantage of future growth in eCommerce,” Mr Fahour said. “Our financial position is significantly stronger as a result and we are further encouraged by the solid performance of both our parcels and Trusted Services businesses. “It is essential we continue to look for new revenue streams for our business. We are working with our corporate and government customers to build on our demonstrated capabilities offered through our national network, which already includes passport registrations, identity checks, banking and payment services. “Importantly, we have improved our service performance and will continue to maintain five-day delivery and our vast network of over 4000 Post Office s.
Australia Post will release its full year results in September 2016. Sharadamani Amma, an 87-year-old great grandmother, remembers a time when the sight of mail runners would cause a great deal of excitement in the small Kerala village she grew up in. The appearance of these postal employees, who carried mail between post offices on foot, meant a letter or money order or, god forbid, a telegram—a sure sign of ill news. But those days are long gone. The postmen are no longer held in high regard in most of the country, and few in the current generation would have even stepped into a post office, at least in urban India. New age e-commerce companies want to change this. The likes of Amazon and Snapdeal already have pilot projects running with India Post, while newspaper reports suggest that Flipkart is set to follow suit. Only two of the world’s continents lie entirely within the Southern Hemisphere: Australia and Antarctica. Australia lies quite close to the equator, while Antarctica is situated about the South Geographic Pole. Antarctica is almost entirely covered by an ice sheet. In extreme weather snow blizzards can cause whiteout, an optical phenomenon in which uniform light conditions effectively make it impossible to distinguish shadows, landmarks or the horizon. This can occur when the snow cover is unbroken and the sky is overcast. Whiteout is a serious hazard as it causes a loss of perspective and direction. However, some beautiful effects can be observed. In the freezing dry atmosphere of the Australian Antarctic Territory frozen water vapour remains in the air as suspended ice crystals. The reflection of light on these crystals creates some spectacular atmospheric effects such as solar pillars, sun dogs and solar halos. These beautiful stamps demonstrate some of the amazing colours that can be observed in the Australian Antarctic Territory. Stamps produced for the AAT (Australian Antarctic Territory) can be used for posting in Australia and all Australian Territories. NEW DELHI: The Department of Posts is likely to soon start a Rs 1,370-crore mega project that will allow India’s 1.3 lakh postmen in rural regions to use network-connected handheld terminals for postal delivery. The project, awarded last year to a consortium that includes state-run Telecom Consultants of India (TCIL), system integrator Ricoh India and Hyderabad-based VisionTek, which provides handheld devices, was delayed due to unavailability of components. Big IT companies such as HP and Wipro were also in the running for the contract rolled out by the ministry of communications & information technology. “Based on terminal devices on network, the DoP initiative is likely to happen later this month. The project was delayed as the private company took time to deliver the components,” TCIL’s chairman and managing director Vimal Wakhlu told ET. When a German lingerie brand wanted to sell bras online in Malaysia, it turned to Singapore’s nearly 200-year-old national postal service. Singapore Post built a website, developed a marketing strategy and now delivers packages for the company, Triumph International. The customer service team even answers questions about sizing. As postage stamps give way to keyboard clicks, SingPost is redefining the role of the letter carrier, by creating a one-stop shop for retailers’ e-commerce needs in Asia. In South Korea, SingPost is helping to sell Levi’s jeans. In Singapore, it is stocking Toshiba laptops. In Malaysia, it is delivering Adidas sneakers. With traditional mail services in decline, post offices around the world are scrambling to reinvent themselves for the digital age. “Sitting on that burning platform, we looked around and said, ‘Where could we develop? '” said Wolfgang Baier, the chief executive of SingPost. 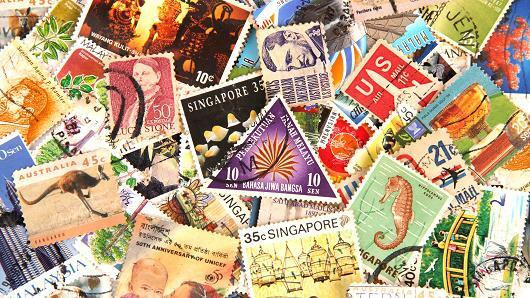 Union Telecom Minister Ravi Shankar Prasad on Sunday announced that a postal stamp would be released in honour of erstwhile Indian emperor Ashoka. He also said he would also pursue the installation of a big statue of Ashoka in Patna and Delhi. “The government would soon release a postal stamp in the honour of emperor Ashoka,” Prasad said at a function organised by Bharatiya Janata Party here to celebrate birth anniversary of Ashoka, believed to be from the present-day agrarian caste Kushwaha. In the caste-ridden Bihar politics, BJP has tried to play Ashoka’s cards ahead of next Bihar assembly polls to woo Kushwaha, an Other Backward Class that account nearly 9 percent of Bihar’s 10.5 crore population. Raumati Beach will keep its postal services after community and political pressure convinced NZ Post to iron out a deal to continue services from Raumati’s Four Square store. The agreement means the store will run postal and courier services across the road from the current PostShop from Monday next Monday . “We are delighted New Zealand Post has listened to the concerns of Raumati residents and will continue providing postal services from the Raumati Four Square. This result is a great example of what a community can achieve by all pulling together,” Kapiti Coast District Council mayor Ross Church said. NEW DELHI: In a rare observation coming from the official auditor, the Comptroller and Auditor General has appreciated the functioning of the postal department. The reason: deliveries of speed post letters which are more reliable and faster than private courier services. Delivery of letters by speed post ranged from 1-9 days in major cities with 99% chances of letters reaching addressees. In comparison, the private courier services turned out to be less reliable with 92% test check letters reaching destination, and time taken ranged from 1-10 days. A CAG report, tabled in Parliament recently, has said that the performance of speed post has been better than the private couriers in major cities, at the tehsil level and at village level.